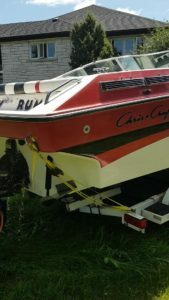 On the 15th of July around 2345hrs, a 1988 Chris Craft 245 Lte 25’ cuddy cabin boat on a trailer was stolen from the parking lot at the marina in Hastings. The boat is red and white in colour and has the name Barney Rumble on the back. The trailer was a dual axle, painted white with some rust. Two unknown suspects hooked up to the trailer and pulled it to the Ultramar in Hastings where they presumably changed a damaged tire on the trailer. Last seen heading southbound on County Road 45 around 0030hrs.